Monday – the usual Monday evening STC swim session. It was a pacing week and we did a lot of 100m sets. I didn’t pace perfectly and was a little fatigued after the Eastleigh 10k but was pleased with my efforts. Some of my SWOLF scores were under 40 (note that the SWOLF is based on Garmin calculation). In recent swims, I’ve ditched the nose clip which I hoped would help with my streaming nose as I was struggling to breath particularly bilaterally. I’d rather feel comfortable while in the pool than be snot free after. Having said that, I’m going to try a different anti-allergy remedy, Pirinase Spray, to see if that helps (thanks for the suggestion Tamsyn). Tuesday – the last Run Camp session of the 12 week block. It wasn’t a full group as Steve, Max and Andy weren’t there. This left me with Gareth to try and beat in the intervals. Not a friggin’ hope!! Gareth is quick and normally covers about twice the distance I can manage. Katherine was struggling with an injury and wasn’t running her fastest. We were doing 3 minute intervals with 3 minute recoveries. We all ran together and it was clear that Gareth was going to lead us. I was pleased to be 2nd on each of the 4 sets. In fact, there was less than 100m between us on each of the sets as I covered 0.72km (720m on average) and Gareth was completing about 800m. Had Steve been there and Gareth not still suffering from a birthday weekend of excesses, I’m sure the gap would have been much larger! On the last two intervals Tamsyn lead us out and went at one helluva pace. Had she been able to sustain it, Gareth would have struggled to keep up. Fortunately for Gareth (and myself), Tamsyn began to flag at around 250m so we could creep by. 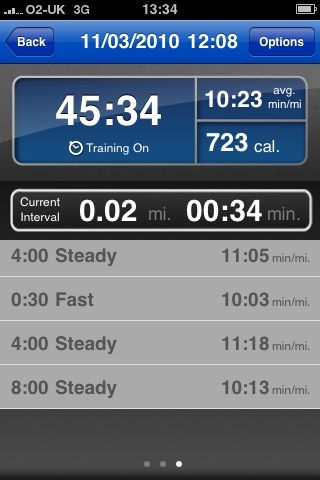 The pacing of each of my intervals was pretty good. I was able to complete roughly 720m each time which was great. Wednesday – 2nd STC swim of the week. An early start of 4:40am to get in the pool for 5:30am. I really struggled to get up and, in reality, it was closer to 4:50am before I got out of bed. I did though. Triathlon training is tough. Fitting 6 or 7 sessions in per week is a struggle at times. There were 4 of us in the lane and I didn’t disgrace myself with my performance. These sessions are 80 minutes and we covered 3.2km again. Good session. More miles in the pool. Thursday – given that Mother’s Day is massive for online florists, I knew this week was going to be busy. That meant that I had to do a treadmill run. I decided that a 5km pyramid run would be something fun to do so did!! Not much to say about the session. I did it and felt good. Friday – workload meant that I couldn’t get on the bike, swim or run so I did some S&C. Chest presses, planks, wall sits, tricep dips, tricep curl, etc. Saturday – yet more work and no opportunity to parkrun or so the STC swim session. I did, however, get the bike on the rollers between firefighting issues. I managed about 35 minutes over 3 sets. Nothing earth-shattering other than not falling off which I guess is a positive. In other news, I’ve decided to tackle my 40-inch waistline. Given all the training I do, you’d expect me to look skinny. However, I’m packing a spare tyre that would be more appropriate on a truck. It’s slowing me down and acting like an anchor when I swim. In fact, I’m sure it sometimes skims along the tiles at the bottom of the pool. Anyway, you get the picture, or maybe it’s best that you don’t! 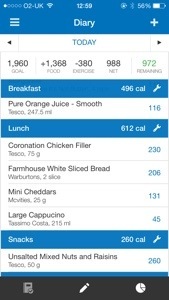 Ant Gritton of Run Camp made a suggestion in a recent Facebook post to use MyFitnessPal. I’m fairly sure I’ve tried it briefly in the past but am glad that Ant mentioned it again as it is an incredibly great app! Their website stinks though so avoid that. Using the app is so easy particularly given its incredible database of foods and the fact it remembers that you eat regularly and what combinations of foods you have together. I really can’t fault the app at all. The only thing I change is the calories burned through exercise where I use my Garmin-calculated calories rather than those suggested by MyFitnessPal. 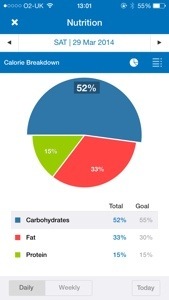 I’ve set myself a weight-loss goal which is reasonable and am tracking everything I eat and so far, it’s going well. This is the first of 3 posts about my experience of RunCamp. RunCamp is a 12-week practical course which aims to improve the running style and efficiency of participants. The courses are run at Southampton Common and Chandlers Ford with new venues being added as demand grows. The courses are run by fellow LRR member, Ant Gritton. Ant is a runner and triathlete with a very good pedigree of achievements in both. Each course has about 6 participants and I chose the Friday morning session which runs from 6:30pm until 7:30. I’m lucky enough to know a few of my fellow students (namely Irene, Jules and Charles) so that helped break the ice. I decided to take the course because I felt my running had plateau’d a little. I also tend to run alone quite a lot and the sessions are a great way of socialising. In my personal opinion, Ant has got RunCamp just right. To date, there’s not been one moment when I’ve felt even slightly negative about something we’ve done, been taught or the manner in which we’ve been taught it. Ant has also cleverly marketed the courses to fellow club runners and, indirectly, to parkrunners via social media and the amazing positive feedback he gets from the ‘students’ each week acts as the main source of his business; word-of-mouth referrals. I can’t wait to enjoy the next 8 weeks of the course and share that enjoyment with the other students. I’m already finding that my running form is improving and it’ll definitely be interesting to see the improvement in my running performance over the next couple of months. Ant’s RunCamp is currently focused in the Southampton area but I believe that he also has the business acumen and focus to build a franchise model across a wider geographical region. If you want to improve your running technique and live in the Southampton area, you really won’t be disappointed if you invest in RunCamp. In fact, there’s no risk as Ant regularly holds trial sessions which are well worth getting up early for!! In March 2010, I ran the Eastleigh 10K in a little over 57 minutes. Having PB’d at the Stubbington 10K in January on a more difficult course, I knew I had a very good chance of shaving a good few minutes off my Eastleigh 10K PB on Sunday. In fact, a couple of recent 5K runs of close to 23 minutes proved that getting close to 50 minutes would be possible if I pushed hard. During one of those 5K runs, my pace averaged at 7:31 minutes per mile, significantly faster than I’d managed to run before. With this in mind, I set myself the challenge of completing the Eastleigh 10K sub-50! My training advisor/coach, Rachael Elliott, agreed that this was possible and provided lots of advice on ensuring it. Thanks Rach! Prior to the race, it was great to see lots of Eastleigh parkrunners. When I told some of them of my goal time, they looked uncertain I could knock over 7 minutes off of my previous race time and improve my 10K PB by over 3 minutes (the PB was only 2 months old). The idea of running slow to get fast seemed contradictory and running slow really didn’t feel natural for a few weeks and for several slow runs, my Average Heart Rate, AHR, was too high. I gradually learned to control it though. So, back to the race… Having screwed up some races by over-hydrating and going off too fast, Rach’s advice proved invaluable. In fact, in terms of hydration, I had a coffee and orange juice at breakfast 3 hours before race start and then a couple of sips of water 30 minutes before. At this point, I should add that I was going to be running in my brand new K-Swiss K-Ona C running shoes. Having never run in them before, this was definitely a gamble. I risked blisters and that could ruin my chance of reaching my target. However, the Newtons that I’d won as Eastleigh parkrunner of the month back in October/November 2010 were looking very worn and had clocked up over 500 miles. K-Onas it was!! My plan (based on Rach’s advice) was to run even splits at 05:00 mins/km pace. As the start gun fired and I headed (with the other 1300+ competitors) for the start line), I taped the bezel of my Garmin and then couldn’t press the Start button as it re-located satellites. Grrrrr! 0.2km into the race and I could see my stats. I focused on running 05:00 on average and completely ignored my heart rate (I have a tendency to see a high HR and then ease back but knew that if I did that, I’d risk meeting my target. At my pace, I calculated that I’d have to cross the finish line in under 49 minutes based on my Garmin. But before that, there were 6 miles to cover. Having the Garmin proved invaluable. I could see my average pace constantly and could adjust my pace to keep at 05:00. The first 2-3 km went well. Last year I struggled up the hill past Ham Farm but this year it felt easier. 3-5km went ok. 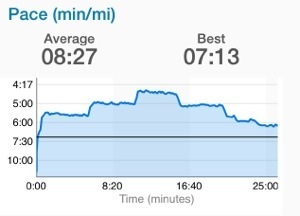 I had to keep check on my average pace at this point as there was still a very gradual incline. At 7km, I needed some water and grabbed a cup at the water station. 2 sips and it was discarded. My pace had dropped and I had work to do. Things got tougher but my goal was at the forefront of my mind. I knew I’d made up a few seconds in the first 5-6km so could ease the pace a little but any more and my goal was in jeopardy. The last 3km went quickly and for the last km along the path on Fleming Park field, I pushed a little harder. Not only did I have a few seconds to make up but also I didn’t really know my pace for the first 0.2 km. The finish line came into sight and I crossed in under 51 minutes. My Garmin showed 48:46. I think I might have done it!! However I wouldn’t know for sure until the results were published. It was a long wait. Late in the afternoon, the results were available. 49:49!! An Eastleigh 10K PB of over 7:30 and a 10K PB by exactly 4 minutes. I was pleased to say the least. A sub-45 10K no longer seems an impossible dream!! So, what can I attribute my performance to? Mainly Rachael! Her training plan and advice was key. Without those things, I’d have probably run too fast in training, over-hydrated and set off to fast during the race. Most importantly, I’d not have believed that I could finish in under 50 seconds. At the start of the year, I set one of my goals for 2011 to improve my 10K PB from 57:22 to 47:41. I’m now (only!) 2:08 from meeting this goal. And now to really push the envelope, my goal for Eastleigh 10K 2012 is to finish in under 44 minutes. Will I do it? There’s only one way to find out! New to running? 12 points to make sure it’s an enjoyable experience! 5. Run with a friend or join a local running club – this will motivate you to get out running when you really don’t feel like it! If you’re in the UK, consider Park Run or Run In England. 6. Sign up for a charity run – this way you’re not only running for yourself, you’re running to help others. That’ll motivate you to get our running too! Lots of charities have places in 5K, 10K, half-marathon and marathons. 8. Be safe – let someone know where you plan to run and when you expect to be back. Be vigilant of any strange activity. But don’t worry too much! 11. ALWAYS stretch and warmup/cooldown – check out CoolRunning’s stretches for runners. So, there you have it. Lots more running related websites to surf for… Feel free to share your own tips! Over the last few months, my speed and performance have stagnated. I’ve been disappointed as I know that I should be able to put my foot on the gas and go faster but when I try I seem to burn out. In reality, my pace isn’t going to set me high up any leaderboard and I’m still trying to work out how I’m going to get around the Great South Run’s course of 10 miles in October and survive! A while back, I read about Fartlek training. Fartlek is Swedish and means ‘speed play’. It consists of alternating a number of ‘fast’ sections with periods of recovery. One of the benefits is that you can use Fartlek training in any run and it doesn’t need to be structured. The idea is that you can simply choose a point in the distance (a lamp-post for example), run fast to it, recover and then choose another landmark and repeat. Much more flexible than ‘intervals’ where you typically have to cover a certain distance, e.g. 400 metres. In reality, I didn’t think I’d have the self-control to keep up with the fast sections (most likely giving up after one or two) so decided to create a workout in Runkeeper Pro that would use the principles of Fartlek training whilst giving me some structure. If Runkeeper’s voice told me to run fast, I was more likely to take notice and do it! This basically gave me a 45 minute workout which was perfect for my lunchtime run. Once the workout was defined in Runkeeper, I was ready to try my first Fartlek workout. I made it through the workout and completed the 6 designated fast sections and had a really good (for me) average pace for the workout. I wouldn’t have been able to do it without being disciplined by Runkeeper and even managed a couple of extra fast sections during the cooldown period just to make sure my average pace was good. This activity can be viewed at http://bit.ly/cp7dik on the Runkeeper website. Using Fartleks is pretty new to me but I can see how they can add some spice to a workout as well as prove that you can run faster if you push yourself a little. It’s easy to get stuck in a rut just pounding the pavement at the same-pace workout after workout but what you need is variety in terms of how the workout is structured and where you run. 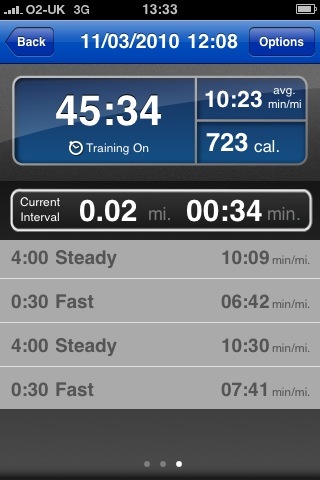 For more information about my favourite iPhone app, check out http://runkeeper.com.